Vacuum systems are widely used in biological laboratories for the aspiration, collection and subsequent disposal of biological liquid waste. Typically, “do-it-yourself” systems, consisting of a vacuum flask connected via a tubing to a water-jet pump, are found in laboratories. However, these self-made systems have some significant drawbacks. 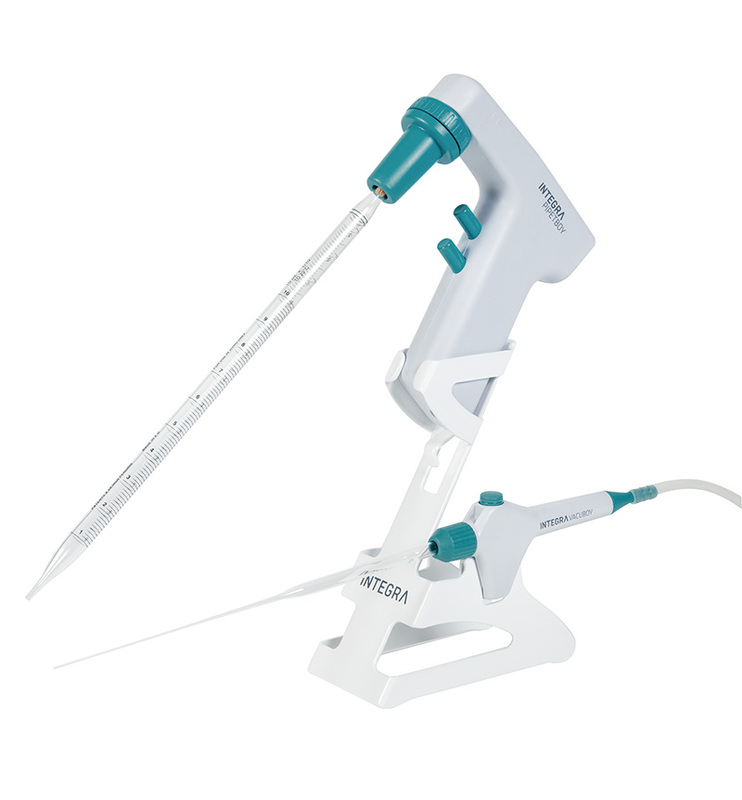 Emptying the flask is tedious and messy, connected Pasteur pipettes can get broken and injure the operator and most critical, the vacuum source often gets contaminated by liquids or aerosols. As a much safer and user-friendly alternative, INTEGRA developed the VACUSAFE Aspiration System. VACUSAFE is a compact, all-in-one laboratory vacuum pump, providing a safe and efficient way to collect and contain biological liquid waste. For maximum safety, VACUSAFE is equipped with vacuum source protection, a shatterproof bottle and a secure stand that holds the bottle in place. VACUSAFE combines vacuum pump, collection bottle, overflow protection and filter in an all-in-one liquid aspiration system. Such a closed aspiration system offers the most effective method for containment of biohazardous liquids by maximal personal protection. The VACUSAFE product range offers different levels of safety depending on the requirements of specific applications. VACUSAFE enables Biosafety level 1, 2 and 3 labs to comply with the stringent user safety guidelines for handling contaminated solutions while maximising productivity and minimising noise and operational inconveniences. An important component contributing to the versatility of the VACUSAFE system is the vacuum aspiration tool VACUBOY because it can be fitted with different adapters for removal of liquids from virtually every laboratory vessel. The application range is further expanded by the possibility to adjust the vacuum level depending on the needs: from gentle removal of supernatants from a centrifuge tube or 96-well plate to fast emptying of a large culture flask. Vacuum control: noise reduction, increased pump's lifetime, minimised evaporation of volatile solvents. Aspiration system with integrated vacuum pump, complete with collection bottle, bottle handle, tubing set with filter, mains adapter and VACUBOY hand operator (155 510).